Discover The Secrets To Free Web Hosting And Get A Massive Break In Cash Spent! Everything You Need To Know About Choosing A Free Web Host. Improve your knowledge about free hosting and maximize your out of pocket expenses! Think about it, it’s not an easy task to just pick a free host and go. There is a lot to know. 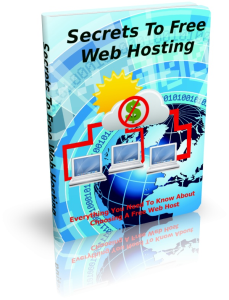 "This Book Below Will Show You Exactly What What You Need To Do To Use Free Hosting Correctly!" As a person just like you who has struggled with all the ins and outs of the correct ways to use free web hosting, I have searched high and low to find the best answers and I am fully qualified and equipped to help you put an end to the struggle of trying to figure out all the tips and tricks with free hosting! There are many free hosting web sites that tout themselves as being free but in reality this is rarely the true picture. Some have hidden requirements while others facilitate tools that would require some kind of cost incurred when forced to use them. Therefore in short when it comes to the reliability issue linked to the free web host, this feature has rather negative connotations linked to it. In order to stay competitive there is a constant need to explore feature that may provide added services to a customer base without any further cost or hassle to them. This is usually well received by the customer and keeps the webhost competitive and viable as a platform for providing free hosting features.